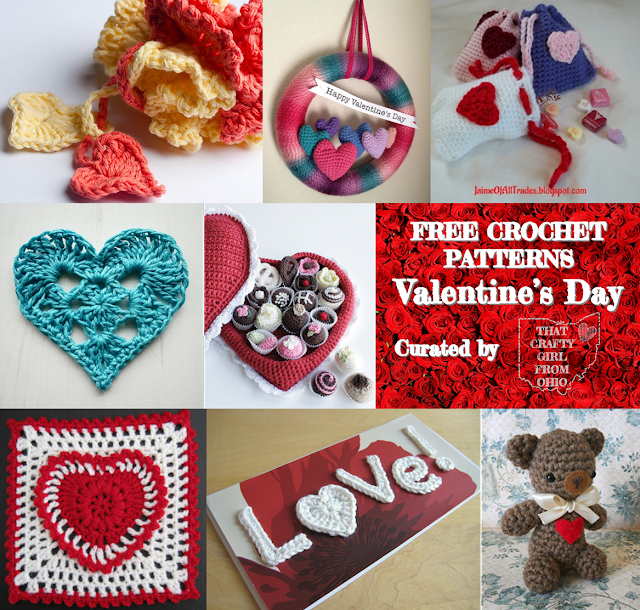 A preview of all the great free crochet patterns for Valentine's Day. Keep scrolling to get the patterns! The cold finally hit here in Ohio over the last few weeks. It finally feels like winter, well most of the time anyways. With January quickly ending we will soon be moving off into February which means Valentine's Day. Homemade gifts are some of the best gifts so why not take some time snuggled up inside where it is warm and crochet some beautiful gifts for your friends and family. I made a collection of free Valentine's Day crochet patterns last year and ended up being pretty popular so I figured I should make one this year too. 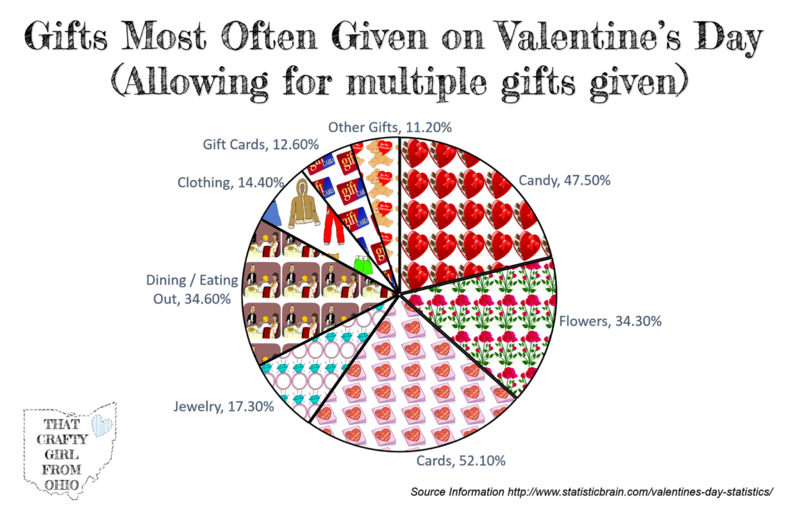 ...Before we get to the patterns check out this infographic that illustrates what people are giving each other on Valentine's Day. Some of the patterns may be in "English" rather than "American" when it comes to stitch abbreviations, make sure you check before you get started. 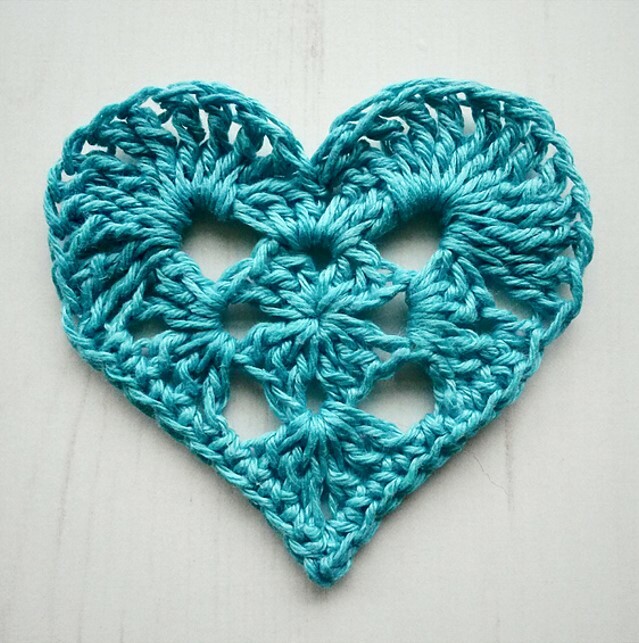 I love to share patterns from accross the pond so that does happen from time to time. gifts as they have the highest percentages, coming in second would be flowers. Okay now to the free crochet patterns. To view a pattern click on the title, that will take you to the location of each design. If you like a design makes sure you tell the designer in the comments section of their blog. We love to hear feedback. If you make a project from this and you would like me to see it make sure you use the hashtag #tcgfo on either twitter or Instagram and I will share your projects here on my blog in this post and in my weekly blog magazine. You can also email me photos directly. I love to see what you are working on. 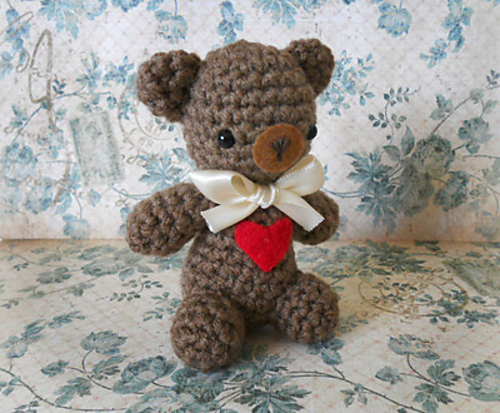 Isn't he precious, measuring at just 4 inches tall, this miniature amigurumi crochet bear would be a perfect gift paired with a card and some candy. Just to let someone special know you are thinking about them. The pattern is worked in tradition amigurumi which is done in spirals without joining rows. It's great to have a wreath available for every holiday, ready to put on your door and greet all of your guests. The color of this one will really pop, particularly if you are part of the crown dealing with snow throughout February. The best part is how fast you could make this project. 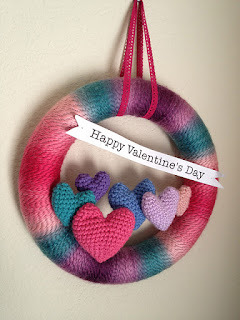 Only the hearts are crocheted and the wreath is wrapped so you could put this fast and fun craft project together in just a few evenings. Candy is a big gift on Valentine's Day and people are going to be giving tons of it away this year. Make your's special by giving it out in these cute little treat pouches. Can be used for candy now and then used to store your keepsakes in the future. 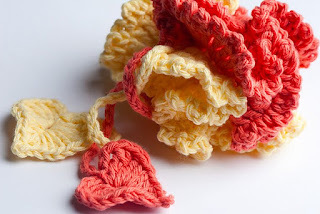 Single crochet and drawstring mean no sewing zippers and liners which save a ton of time. This applique is so versatile, I could see it on so many things. Add it to a card for that homemade touch, add it to a blanket to show the recipient how much you love them. These hearts could be turned into bunting. 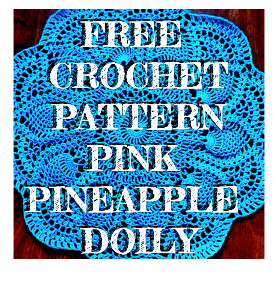 The possibilities are endless and nothing is as classic as the granny square. Give your loved one a box of chocolates they can keep forever and will not make them fat. These cute little chocolates are great for that person that loves to make crocheted food. This would also make a great gift for a kid that has a play kitchen and loves to pretend cook. Know someone that cannot live without coffee? Give them this great cozy for Valentine's Day. Coffee cozies are some of the best gifts as they work up really quick. Sometime you can make one in under an hour. 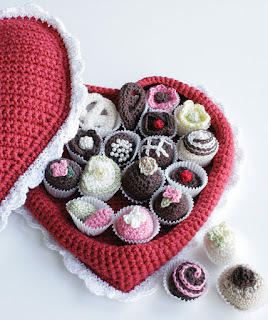 If you need a last-minute Valentine's Day gift but you still would like to give something homemade than this is definitely the fast and easy crochet project for you! Crochet bath puffs are great because you can wash them just like you wash your other rags and they are way more sturdy than those cheap plastic ones at the store. This one has cute little-attached hearts for a love theme. Pair these with some great shower gels and this would make a one of a kind gift. 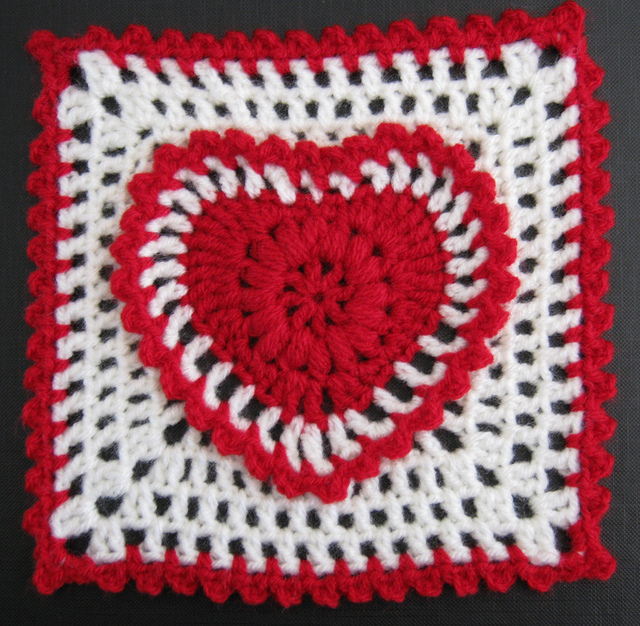 Looking to make an afghan for someone this Valentine's Day? 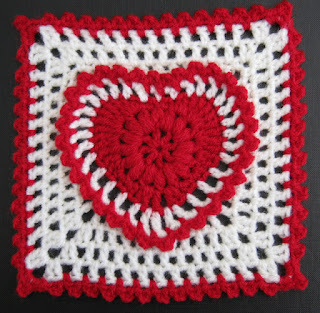 I highly recommend checking out this heart square. A blanket made with these crazy non-traditional squares would be a great gift for anyone of your list this year. Continue the pattern and make the squares even larger. Tell someone you care with these "Love Letters." I love how she thought to put them on the piece of canvas that was already painted. I see pieces like that all the time at some of our bargain stores and that is a way to really make a mass produced piece very unique. I could also see these letters on a blanket or maybe even a scarf. If you know someone that will enjoy these patterns, share this post with them using the buttons on the left, or bottom if your mobile! Thank you so much for featuring my treat bags! This is a great round up! No problem! 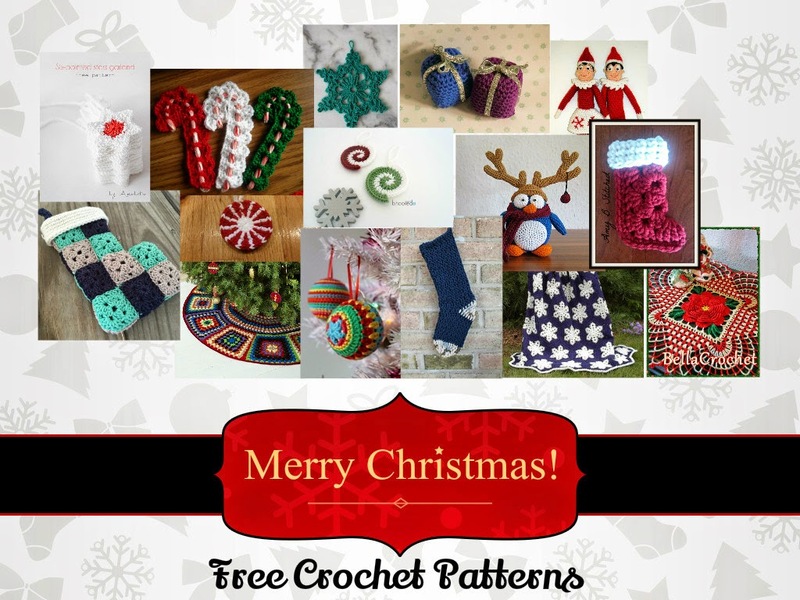 There are so many great free patterns out there, too many to crochet.